Infinite Designs has provided exceptional marble and granite installation in Richmond Texas. Our highly skilled craftsmen will work with you every step of the way to create the new kitchen, bathroom or beautiful Richmond stone flooring of your dreams. We pride ourselves in providing the best quality products available for an affordable price. Our Richmond marble and granite offerings are extensive and design ideas are endless. Infinite Designs offers a wide variety of marble and granite to Richmond residents and businesses. 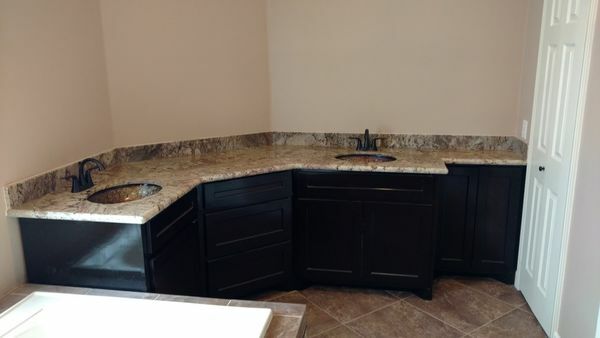 Whether you would like to update your counter tops with sparkling, polished granite or install gleaming marble floors or a staircase, Infinite Designs is skilled and experienced in providing quality marble and granite installation at a reasonable price. Our Richmond natural stone installation team will work with you every step of the way, from choosing the stone to suite your taste, to choosing colors to compliment your home's existing furnishings. Put our experience in the industry and creativity to work to make your dreams become reality. When you call Infinite Designs for your Richmond stone floor or counter top installation, rest assured that we will schedule appointments around your busy schedule and arrive to meetings on time. Once work has begun and through its completion, we will work within a structured schedule to complete your Richmond marble or granite project on time and within budget.